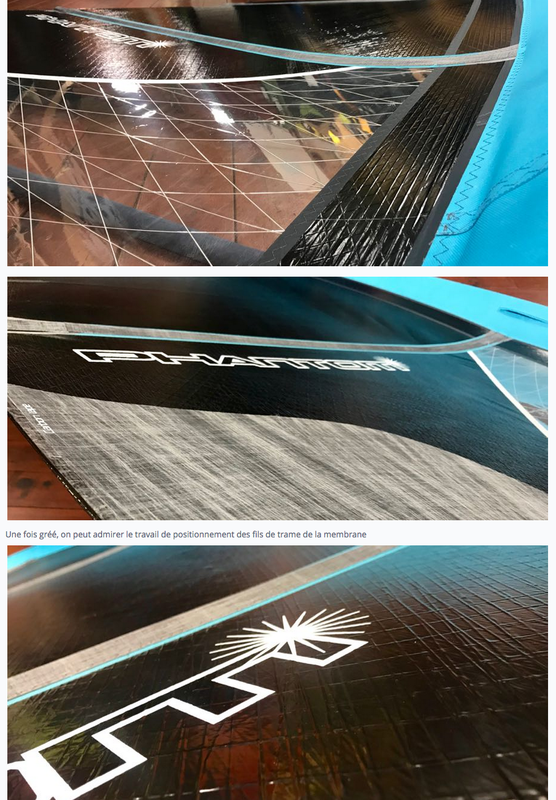 Phantom International, a company renowned in the world of foiling beach catamaran, just introduced its new line of windsurfing sails, called IRIS. 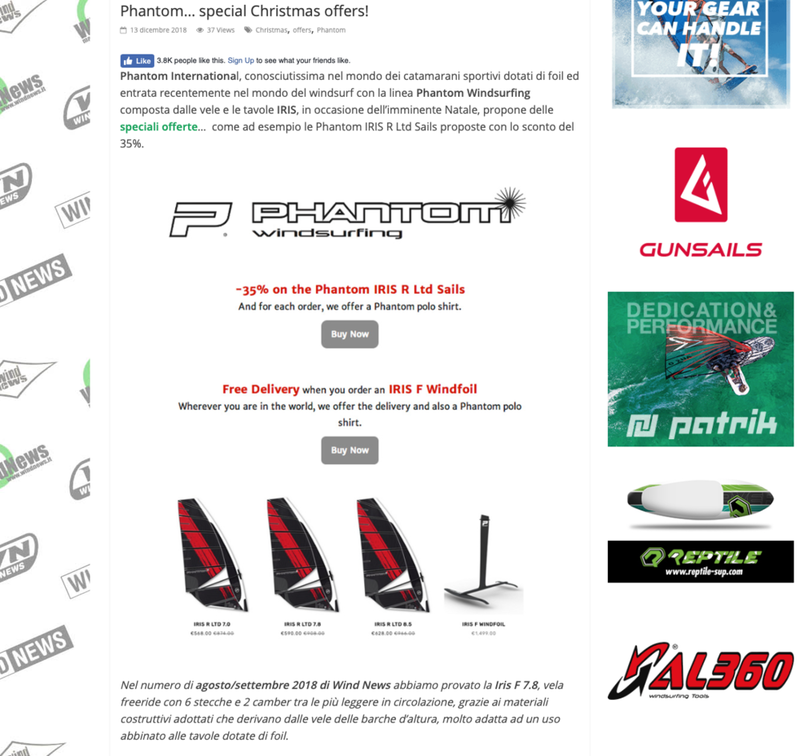 For Christmas, they make special offers, such as 35% discount on the Phantom IRIS R Ltd Sails. In Wind News Magazine (august/september 2018), we tested for you the Iris FR 7.8, a free-ride sail with 6 battens and 2 cambers. It is amongst the lightest sails currently on the market as it includes the same materials as offshore racing yachts, and these are perfect for foiling boards. In 2018, Phantom International launched a new line of Windsurfing Sails called IRIS. 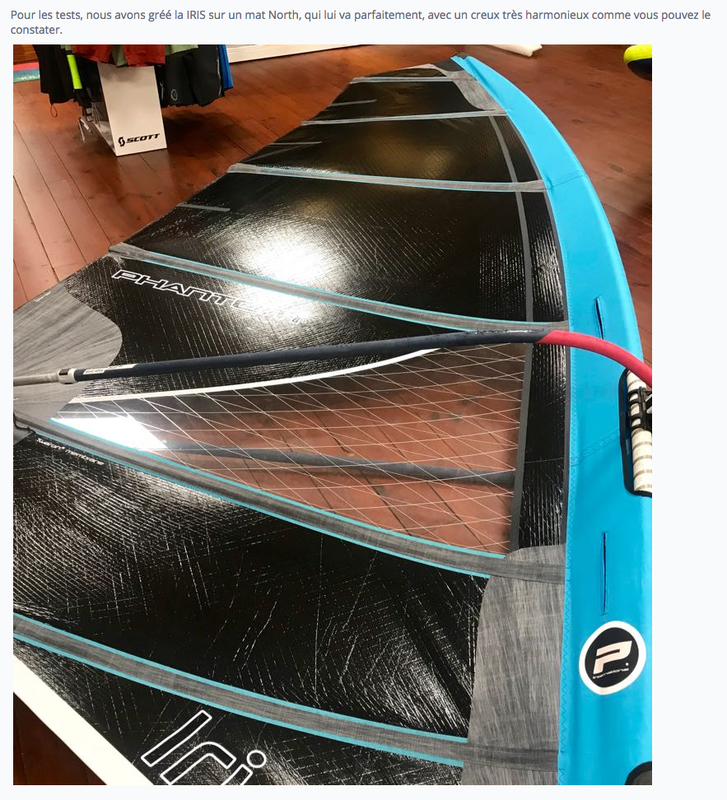 We have tested the IRIS FR 7.8, which includes 6 battens and 2 cambers, it is made of the same materials as offshore racing sails, that we already saw on the Blade and S1Pro from Severne Sails. In fact, we were suprised by the lightness: 4,5 kilos only. This sail is more robust than a normal monofilm freeride. Even the small window is made of a structural material. Aside from its strength and lightness (the Iris F 7.8 waights almost 2kg less than my old Cannonball 8.0), this sail is amazing for its control in strong wind. In light wind, you can start planning easily thanks to the lightness and the deeper shape in the bottom… In strong wind, the Iris FR is very stable and easier to manoeuvre than other sails of the same size. This sail feels nice and performs well in strong wind, it is very comfortable (we can’t feel any excessive traction on the back arm), which makes it easier to maneuvre and you can sail for longer without any more effort. However, when you want to start planning in light wind, you have to go hard on the rotation of the cambers. The second batten from the bottom, just under the window, helps keeping the stability in the gusts, but also makes the sail less reactive while pumping. 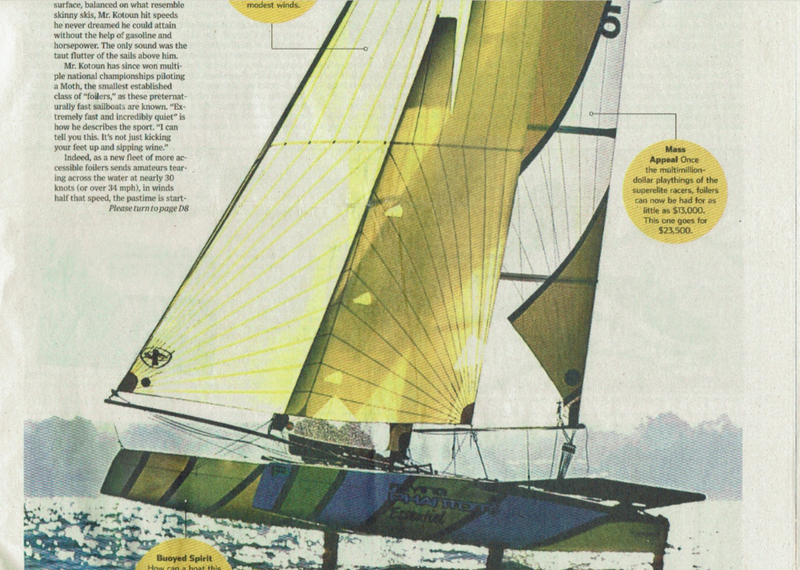 In conclusion, this sail has all the qualities required for freeride, it is well built, light and high performance. + light and strong construction. Nice finishes. Wide range of use. Planning. Performances in medium and strong wind. Comfort. Stability of the shape. - the cambers rotation is a bit tight. Soft and reactive at the same time! Phantom distinguishes itself with its technology and with a unique Iris range whose designs can adapt to all conditions, with 11 sizes covering 4 programs. The construction and 3D Design aim to optimize the efforts and are inspired from high-level yacht-racing like the America’s Cup. Ultra-thin membrane with Twaron fibers are supposed to be lighter and more durable than monofilm or X-Ply. The Phantom range is retailed exclusively online so they can offer high technology at an affordable price. We have tested the IRIS F 7.8 with 2 cams, in the freeride-freerace-foil range. The IRIS F7.8 has a rather tight mast sleeve with a power zone that spreads evenly along the boom. Rigging is made easy thanks to the mast sleeve in water repellant fabric. The mast slides in easily. The cams set-up is also very easy. The IRIS materials make the sail particularly soft, and with a proper block, it is not difficult to outhaul. The sail also has a small vertical batten to give more shape in the mast foot area. The IRIS is very comfortable to sail and it makes a huge difference in choppy conditions. You stay locked in all circumstances. The soft feeling is not scarifying the direct response. In the gusts, the Phantom is not moving an inch. Efforts in hands remain the same. The constant balance of forces offer a more tolerant driving. From a simple and passive sailing on a freeride board, the Phantom IRIS goes to a totally different level and becomes more reactive on a race board. Accelerations become more punchy on each wave impact. It reacts automatically. You just have to let the Iris F do the job. The weight gain of this membrane sail is not obvious but it is so easy and nice to sail that you forget about the cams. We particularly liked the quality of the response when pumping on a foil board with an explosive return resulting in a wider sailing range and fly performances. With only 6 battens for 2 cams for a 7.8, the IRIS F is right in cams sails freeride range with a rig that is accessible even without a huge experience. The tight mast sleeve and the overall softness offer a flexible, comfortable and dynamic sail. 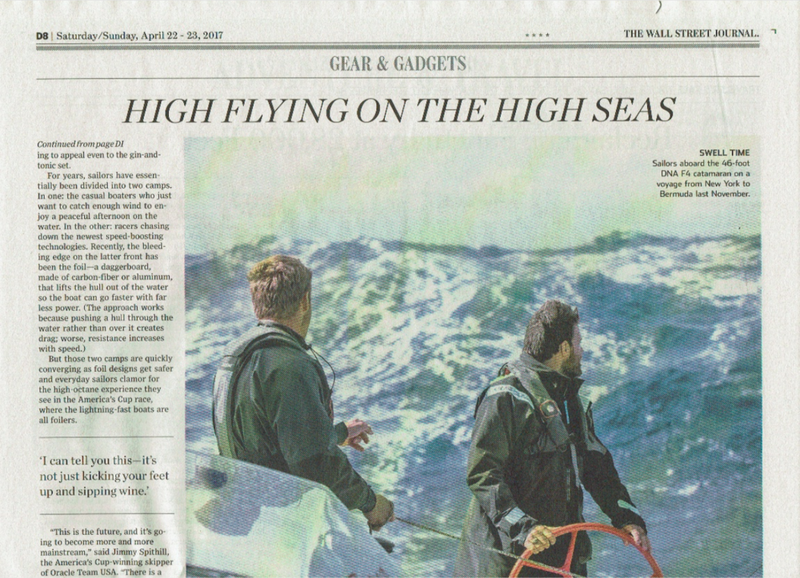 The simplicity to sheet in is a real asset for auto-pilot freeride sailing. The IRIS Freerace L has a irreproachable finish. The footstrap holes positions are freerace orientated, half way between freeride and slalom. The foostraps are well positioned, not too centered, not outer. They are easy to find with closed eyes, and you will stand on the board curve. Experienced racers might want an outer positioning, while freeriders will enjoy the Phantom for the perfect mix of comfort and ‘Gran Turismo’ type of sailing. The pads are simple but have the right thickness, for comfort, and stripes, for a good grip. The Phantom board rides relatively low on the water and without moving, which gives it a gentle attitude in all angles. The bottom is simple and without any cut-out. It offers a good and well balanced support. Under the back foot, the volume is generous. You can push on the 45cm Select fin and have a good heading. The bottom softens the Phantom’s temper. With its full black design, you could expect an aggressive drive. This is not the case. The convertible Race board is very nice on the water. More than a freerace model, the Phantom board leans more on the side of dynamic freeride. Accelerations are long and under control. Sailing it is not physical not technical. The 132 is foil compatible and its moderate width allow freeride aerial windfoiling. It is designed for an aluminum foil for beginners and reaching cruising. The 75cm width is not enough for foil racing and increased efficiency upwind. The Phantom Race Convertible Windfoil L is a board for freeride, both in the fin and foil modes, for demanding enthusiasts wanting nice finishes. The 132 is a simple but performant board for planning cruising. The board absorbs everything and makes the ride easy, efficient and comfortable. The IRIS Freerace is a unique sail as it is not built in monofilm like Avanti Italian sails are. The whole surface of the IRIS sail is covered by a membrane made of very stretched plastic material and a weft thread orientated towards the efforts. We can see the same process on some sails reinforcements (like the NeilPryde Forceline). Here the whole sail uses this construction. Phantom made things well. The sail bag is robust, which is a bonus for a long-term protection. As soon as you open it, you notice this is not a monofilm sail but a membrane sail. The IRIS F name stands for Freerace, while IRIS R will be for the race version. The mast sleeve includes the two cams of the sails. Again, the choice of material has been made for long-term protection. One last detail: the mini batten as the bottom of the sail, to avoid unwanted creases and to guarantee maximum efficiency of the power zone below the boom. A small tool is provided to help close the batten pocket if you had to take the batten off. To outhaul, the IRIS sail is equipped with a a traditional block of three pulleys. This is the best solution for an easy outhaul. The mast foot protection in cordura is thick. For the test, we have rigged the IRIS sail on a North mast, which fits perfectly, with a nice and well balanced shape. The design and the construction of the sail are very well done, with few folds compared to other sails. The shape below the wishbone is wide, but the sail is not flat at the head, which promises a nice power. Once it is rigged up, you can admire the threads work on the membrane. One of the major assets of the Phantom sails is the weight. We put it on our scale to double check. The IRIS F weights 4,400kg compared to 4,900kg for the RS:On 7m convertible (which is a V8, one of the lightest 2 cam sails on the market). A S Type SL 7.3 weights 5,9kg and a 7.0 Skyscape weights 5kg, with one batten less. The IRIS F meets the expectations with the light weight, and this will be confirmed in the maneuvers. 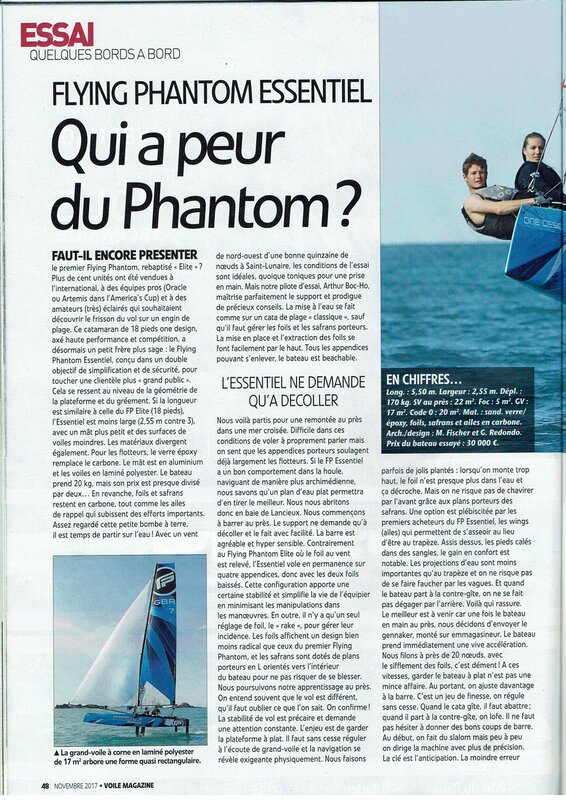 We have tested the Phantom IRIS both in free sailing, (in St Laurent du Var and La Ciotat), and racing (in Toulon). As soon as you have it in hand, you will be surprised by the light weight. Despite of this, the cambers are locking the profile, and this is a good thing. This 7.0 seems way lighter than other sails 0,5 or 1,2 meters shorter. It made us think of the feeling we had with Loft Skyscape, but here with an extra batten and a better profile control in the gusts. The down side is a sail that is not very nervous. You should not expect fast reactions, but this is to benefit first hand comfort and very consistent traction. Other ‘typical’ softs sails would not be so efficient pumping. Here the perfect mix between power and lightweight create a very efficient sail (if you have an equally good mast). With the same weight and technical level, we started planning at the same time on the IRIS 7.0 and the Switchblade 7.8. In the maneuvres, the lightweight of the IRIS is impressive. And the cambers rotation is easy despite the deep shape… It feels like velvet! The Windfoil Regatta in Toulon was also a good test. Considering my lack on winter training, I could not have spent the whole afternoon on the water with a traditional free-race sail. With the IRIS I managed to finish all legs in a good position (5th out of 25 entries) without giving-up or finishing in agony, but also with being able able to follow the 4 strong and fit windsurfers in front of me. To sum up, the IRIS F with 2 cam impresses with its lightweight, its softness and its comfort, while providing nice power and results which are amongst the best in freeride category. The icing on the cake is the durability of the material, which can only be stronger than monofilm! If you are interested, we have one for testing and we will be taking it on various windfoil events this summer. This Freeride sail with 6 battens and 2 cambers is amongst the lightest sail in the marker. It features a high tech construction with expensive membrane that is used in offshore sailing and by some brands like Avanti or Severne (Blade and S-1 Pro). The concept is the following: a machine lays fibres very precisely (based on the sail's mechanical stress) on a film and covers them with another thin film (0.75mil - In comparison, a monofilm or X ply is between 4 and 5 mil. These fibres hold the sail and it can be creased without being damaged. Then another "light skin" and stylish layer of filaments is layed to reinforced the corners. The sail was designed by Alex Udin, Phantom International founder, who has a huge experience in yacht, catamaran and windsurfing sails and masters the latest 3D softwares perfectly. These sails will be updated every two years and are available on their e-store. The Iris F 7.0 was tested with an 100% carbon constant-curve mast provided by Phantom and it is as easy to gear as other similar sails. There is only one clew eyelet. The profile is smooth and seamless with a slightly bigger draft at the front depending on the tensions. This sail offers a surprising range of settings. It's like a flexible sail that you can adapt to the wind conditions, type of board (windsurf/windfoil) and the aimed results, with a more or less flat profile at the front and a more or less open leech. For example, you can keep the leech tight for windfoil or to windsurf in light wind, or open the leech when the wind gets stronger and you want to slalom with a thiner profile on the leading edge, less physical. You hold it far because the tensions are spread throughout the whole profile. It is a "chameleon sail" that is extremely light and soft in the body, which is comfortable in the chops and reduces the efforts, specially in the maoeuvres. It also has a very stable profile and a perfect passage in the cambers. It also give great Freeride/Freerace results! We just deplored a little lack of visibility when you sail in group and have to gybe. The first test (with this mast) is very positive in terms of pleasure, operating range (very wide) and performance. We particularly liked the light weight, the profile when pumping and in the chops, the wide operating and setting range, the easy performances and the cambers rotation. The membrane construction is undeniably an asset. 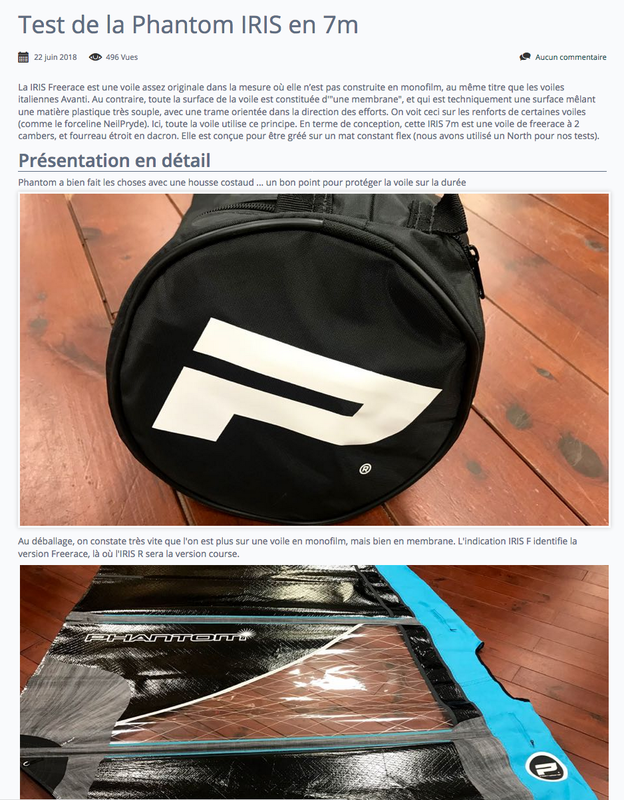 Phantom International, entreprise très connue dans le monde du catamaran de sport sur foils, vient de présenter récemment sa nouvelle gamme de planches à voile « IRIS ». À l’occasion des fêtes de Noël, elle propose des offres spéciales… comme les voiles « Phantom IRIS R Ltd Sails » escomptées de 35%. 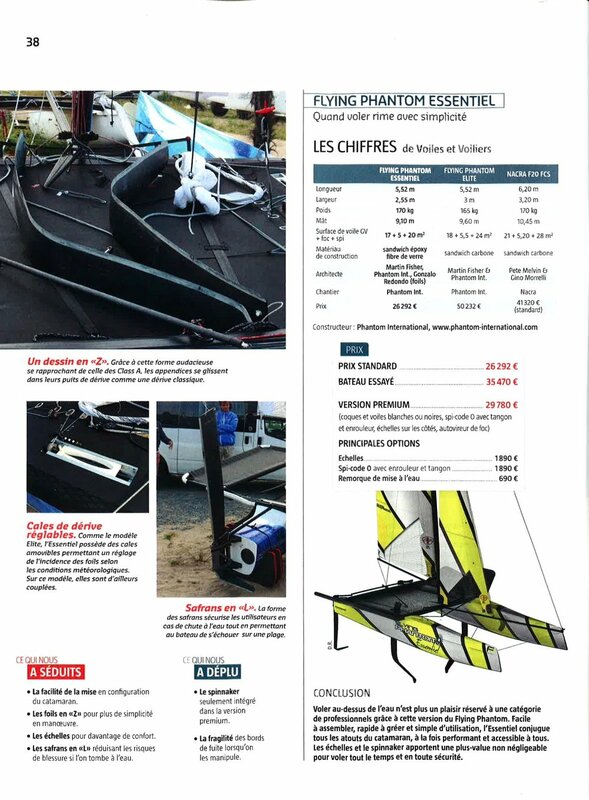 Dans le magazine Wind News (août/septembre 2018), nous avons testé pour vous la Iris F 7.8, voile freeride composée de 6 lattes et de 2 cambers. Elle fait partie des voiles les plus légères en vente grâce à des matériaux dérivés de voiles de bateaux offshore, très adaptées aux planches sur foil. 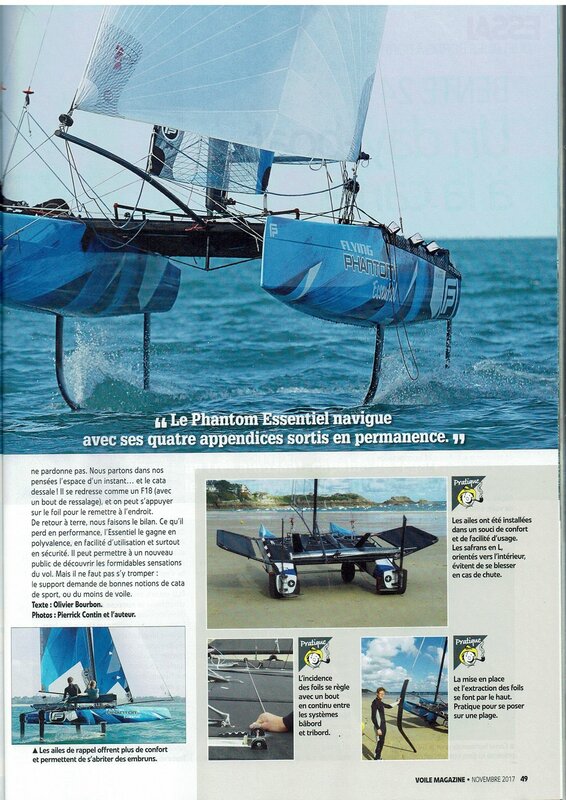 En 2018, Phantom International a lancé une nouvelle gamme de planches à voile IRIS (cf page 24). Nous avons testé pour vous la voile freeride IRIS 7.8 composée de 6 lattes et de 2 cambers, et fabriquée avec des matériaux dérivés de voiles de bateaux offshore, déjà « connues » grâce aux voiles de vagues Blade et S1 Pro de la marque Severne Sails. En fait, c’est la légèreté qui impressionne : environ 4,5 kilos ! Cette voile est en effet bien plus solide qu’une voile normale de freeride en monofilm. Même la petite fenêtre de la voile est faite d'un matériau texturé. Mis à part la solidité et la légèreté (la Iris FR 7.8 pèse quasiment 2 kg de moins que ma vieille Cannonball 8.0…), cette voile impressionne pour sa tenue dans le vent fort. Dans un vent léger, il est possible de partir facilement au planning, en vertu de la légèreté et de la base de la voile qui forme un « ventre » bien creusé... C'est dans le vent fort que l'Iris FR montre l’allure très stable qu’elle réussi à tenir, de plus elle est beaucoup plus simple à manœuvrer que les autres voiles de la même surface. La voile est agréable et performante dans de fortes conditions de vent, grâce son confort (on ne ressent pas de tractions excessives dans le bras arrière) qui la rend plus simple à manœuvrer tout en naviguant plus longtemps sans faire plus d’effort. En revanche, il faut y aller franchement dans la rotation des cambers quand il s’agit de partir au planning dans le light wind. La deuxième latte de base, juste en dessous de la fenêtre, contribue à maintenir la voile de façon très stable en rafales, mais la rend aussi un peu moins réactive au pumping. En fin de compte, la voile respecte les qualités indéniables d'une freeride, bien construite, légère et de haute performance.